The beryls are among the most popular, and also the most expensive, of all gemstones. From bright blue charm of aquamarine to the intense green fire of emerald, from the soft pink glow of morganite to the rich yellow hue of heliodor, and from the blood-red color of bixbite to the colorless goshenite – all of these gem varieties are from a single gem species: Beryl. Colorless goshenite is often the purest form of Beryl, while the other beryl varieties are colored by the presence of minute trace elements or impurities and they should all be viewed as valuable precious gems. The critical factor in judging and pricing beryl is its intensity of color and this has meant more material being treated (heat or irradiation) in some way to improve the coloring. The name “Beryl” is derived from the Greek beryllos, possibly of Indian origin, although the meaning is not known. The German word brille (speculate glasses) is derived from it as, in antiquity, eye glasses were made from beryl. Beryl has a hexagonal, prismatic structure and occurs in granites and pegmatites as well as in alluvial deposits of gravel. All beryl family members are brittle and therefore easily damaged by knocks, have a vitreous luster, and they occur with aquamarine. The occurrence of beryl is widespread globally, but some varieties, such as bixbite, are mined from only a single small locality. Beryle occurs in granitic rocks, especially granite pegmatites; also in schists (emerald), metamorphic limestones (emerald) and hydrothermal veins. Below is a short description of each family member of beryl gemstone group. 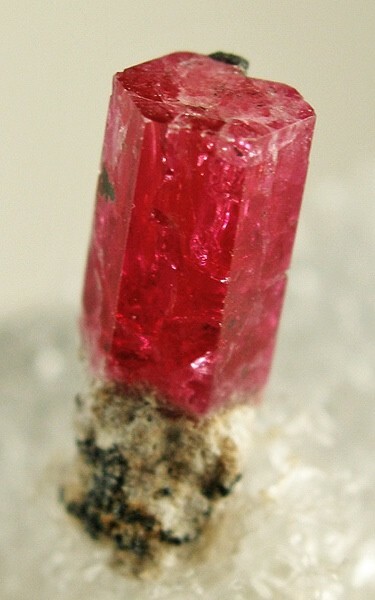 1) Bixbite: This is a very rare, strawberry-red color, form of beryl. The meaning of the word bixbite is unknown (It might have named after Mr. Bixby). It is usually found in small gem-quality crystals therefore cut gemstones normally weigh less than 1 carat. Red beryl is not easy to source (it can mainly be found just in the United States) and is very expensive that is not really a viable gemstone for jewelry. .
2) Morganite: This is the well-known pink variety of beryl family. The pink color of morganite is due to presence of minute traces of Manganese and depending on the levels of manganese impurities, morganite can be pale pink, rose-pink, peach, apricot/salmon and even violet in color. The deeper the pink color, more valuable it is. Lower color quality can be improved by heat treatment at 400°C. Like aquamarine and emerald, morganite is dichroic which means it can show two shades of color if viewed along two different axes. Morganite was named after mineral collector J. P. Morgan. 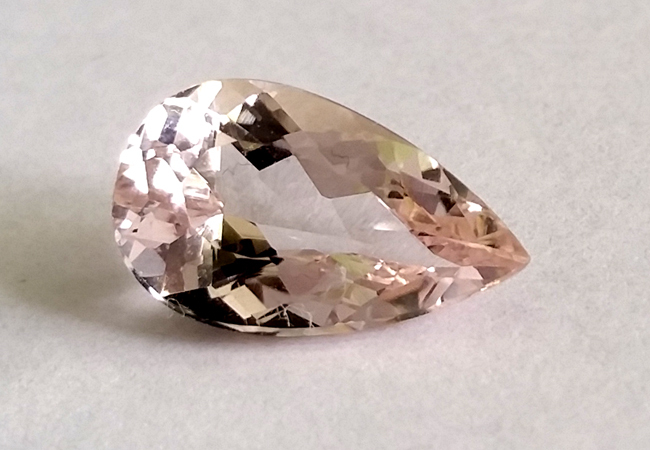 Morganite can be found in Madagascar, Brazil, Mozambique, Namibia, Pakistan and Zimbabwe. 3) Heliodor: This is the yellow variety of beryl family (color varies between lemon yellow and gold). The name heliodor is derived from the Greek Helios (meaning sun) and doron (meaning gift) which is translated to "gift from the sun). 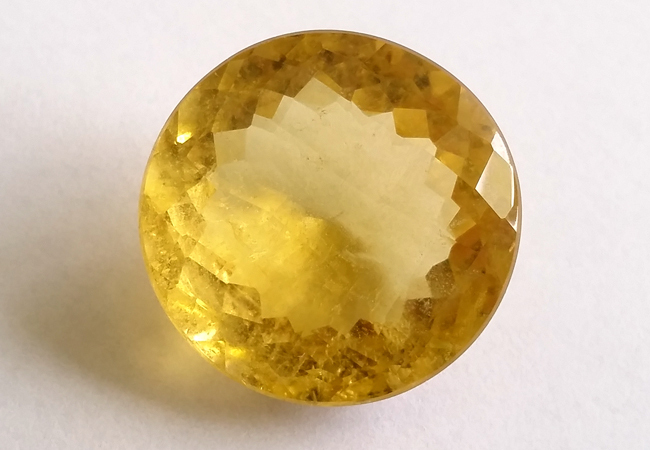 Heliodor may contain fine tube-like inclusions that can create a cat's eye effect when cut in cabochon form. It is often found associated with aquamarine in pegmatitic vugs. Apparently it was discovered in 1910 in Namibia, however, similar stones had previously known in Brazil and Malagasy Republic. The finest, gem-quality heliodor comes from the Russian Urals and Brazil. It is also found in Mozambique, Namibia, Pakistan, and Zimbabwe. 4) Goshenite: This is the purest form of beryl with no trace elements in the gemstone, therefore it is colorless. It is sometimes referred to as the "mother of gemstones" because the addition of various trace elements in nature transforms it into emerald, aquamarine, morganite, heliodor, or bixbite. It was named after the place it was discovered for the first time, Goshen, Massachusetts, USA. When faceted, goshenite has a good brilliance and could be confused with white topaz or white sapphire; baked with silver foil in a closed setting it has even used to imitate diamond. Goshenite gemstone can be found in Brazil, Canada, Russia, and USA. 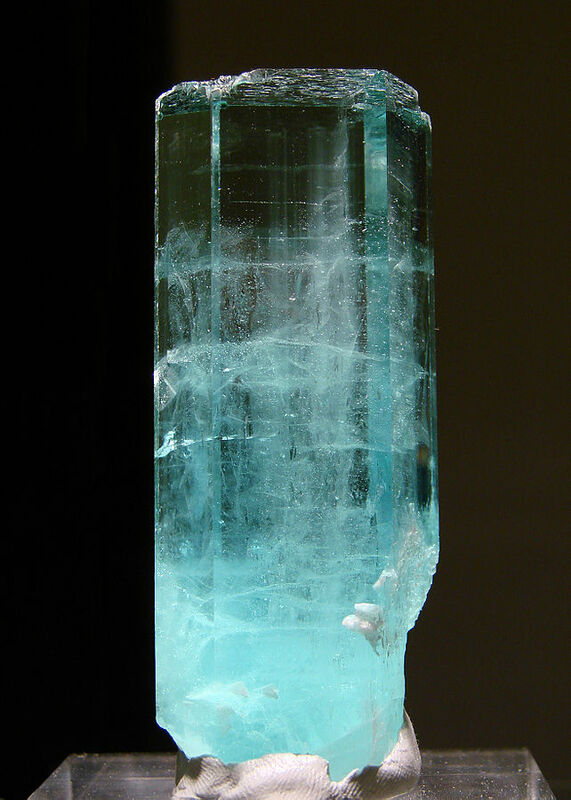 5) Aquamarine: This is blue variety of beryl. It is named because of its sea water color (Aquamarine is Latin for water of the sea). The dark blue is the most desired color for aquamarine gemstone. A rare variety of deep blue aquamarine called maxixe is known from Maxixe mine in Minas Gerais, Brazil. Aquamarine is dichroic, so the intensity of color changes depending on the angle it is viewed from and the material is usually cut according to best color angle as opposed to greatest size. Aquamarines have much better clarity than emeralds. It is far easier to find clean stones at a good size, and fewer inclusions and cracks mean there is less internal stress and the material less brittle. 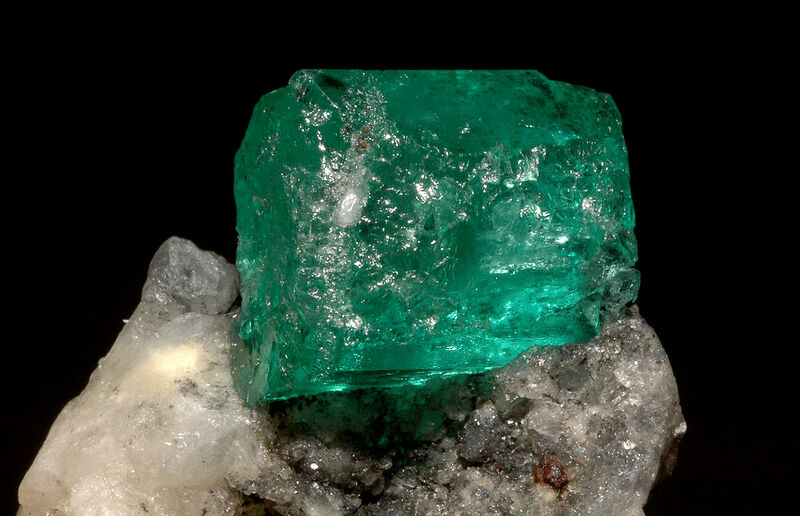 6) Emerald: This is the rich green beryl. The green color is due to presence of Chromium and vanadium. The color of emerald varies according to its source or location, the most desirable color being a strong, slightly bluish green. The name emerald derives from Greek Smaragdos, which in turn came perhaps from the Persian. It means "green stone" and in ancient times, refereed not only to emeralds but also probably to most green stones (in other source: emerald is derived from the French Esmeraude meaning green gemstone). Colombian emeralds are pure green with a faint tint of blue. They are dichroic, which means the color has two axes and will vary in appearance depending on the angle from which you look at it. 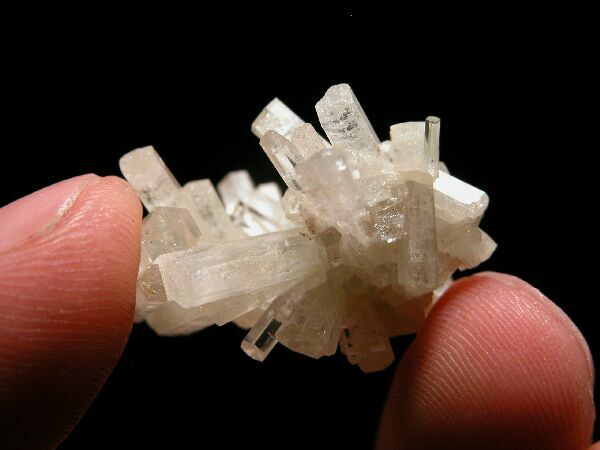 Beryl is characterized by long, hollow tubes, sometimes filled with liquid; the tubes are parallel and run along the length of prisnatic crystals, sometimes have a brownish color and may contain gas tubes. Negative crystals are also seen, as well as flat inclusions that resemble snowflakes and have a metallic look, known as chrysanthemum inclusions. Aquamarines contain, in addition to the above, crystals of biotite, phlogopite, rutile, pyrite, and ilmenite in skeletal crystals that sometimes allow the cutting of star beryls. 1) Judith Crowe, The jeweler's directory of gemstones, Firefly book, 2012. 2) Walter Schumann, Gemstones of the world, Sterling publishing, 1977. 3) Lance Grande and Allison Augustyn, Gems and Gemstones timeless natural beauty of the mineral world, The University of Chicago Press. 4) Color Encyclopedia of Gemstones, Joel E. Arem, VNR publications, New York.